Internationally renowned Canadian filmmaker and theatre and opera director Atom Egoyan began his academic career at Jiminy Cricket Kindergarten in Victoria without knowing a word of English. Born in Cairo to Armenian parents who immigrated to Canada in 1962, Atom Egoyan was acutely aware that he and his family were unusual in the very English west-coast city of Victoria. Like the children of most immigrants, he wanted nothing more than to learn to speak English and assimilate as quickly as possible. 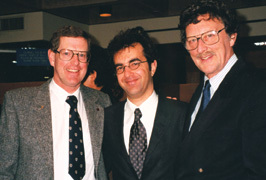 David Bennett and Colin Skinner joined Atom Egoyan when he received his honorary doctorate at the University of Victoria, November 1998. The most active playwright among the Glenlyon teachers was Egoyan's Grade 6 teacher, Colin Skinner, whose play Robot included a character called Atom who was played by Atom. “This really changed my world and I started writing my own plays.” Skinner wrote plays that were performed within the school and mounted student productions for the annual Victoria Student Drama Festival. “The plays were real events for us and they produced a high level of excitement,” says Egoyan – in part, perhaps, because they brought contact with the students of Norfolk House, a private girls' school and sister institution that later amalgamated with Glenlyon to become the co-educational Glenlyon Norfolk School. Egoyan spent his final high school years at Mount Douglas Senior Secondary – affectionately known to the students as “Mount Dog.” Mount Douglas also had an active drama program and Egoyan happily continued to write plays, several of which were produced and directed by Dougal Fraser, with whom Egoyan had stayed in touch. 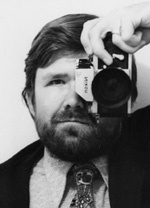 In 1997 his film, The Sweet Hereafter, which he adapted from the Russell Banks novel, won three prizes at the Cannes Film Festival: the Grand Jury Prize, the International Critics' Prize and the Ecumenical Award for Humanist Filmmaking. The film also received two Academy Award nominations, one for Best Director and the other for Best Adapted Screenplay. When Egoyan received an honorary degree from the University of Victoria in 1998, many of his teachers were invited to the ceremony. “What teachers do is heroic,” says Egoyan. “To me, theirs is a sacred calling. It's essential to how society will be formed and yet is not often acknowledged. It's so important that teachers preserve a sense of how significant and important their work and their enthusiasm is. Atom Egoyan was knighted by the French government with the Chevalier des Arts et Lettres, received the Anahid Literary Award from the Armenian Center at Columbia University, and was inducted into the Order of Canada. He has received honorary doctorates from universities across Canada. Lead photo by Anthony Woods. Additional photos courtesy Glenlyon Norfolk School.